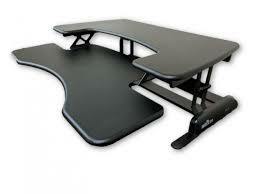 Today Varidesk is recognized as a leader in the standing desk industry. 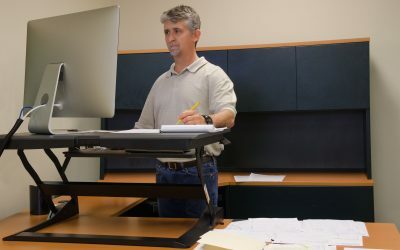 Not only was it one of the first companies to introduce desktop risers or converters, it also paved the way for other such products by creating awareness about converting a traditional desk into standing desk with the help of risers and converters. 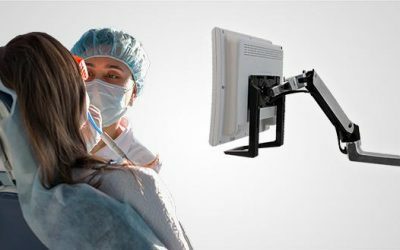 Need to bend to operate lift mechanism – The lift handles – the handles that need to be pressed inwards to raise and lower the ProPlus 36 – are located at a distance from the front edge of the keyboard tray. Because of this distance, the user needs to bend forward – an unergonomic position by itself with the lower back under stress – in order to sit or stand. Apart from the bending, pressing the handles and continuing to press them till the ProPlus 36 reaches your preferred level requires force, which further strains the lower back. Stretches outside the footprint of desktop – When a user raises the ProPlus 36, it stretches out towards the user, outside the footprint of the desktop. So in order to stand up and work, the user has to step back. This makes ProPlus 36 inconvenient in small cubicles or limited space work areas. Design makes it wobbly, unstable – Because of the way in which the keyboard tray stretches out of the unit’s footprint, the ProPlus 36 is wobbly at elevated levels. And there is also a risk of the entire unit tipping over. Annoying noise – The ProPlus 36 has 11 height settings between sitting and standing. Every time the user needs to change the height setting, lift or lower, the unit makes a squeaky sound with every setting. This can be annoying to co-workers. 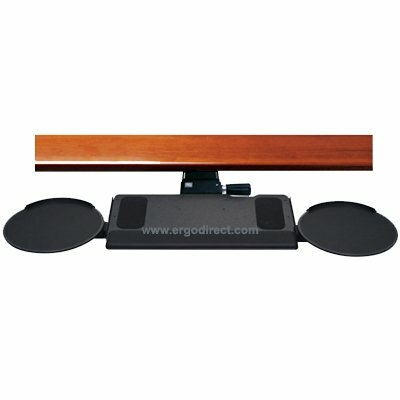 Keyboard tray’s curve – The keyboard tray of ProPlus is 36″ wide giving ample space for a keyboard tray as well as dual mice. However the inward curve in the keyboard tray places the mouse outside your neutral typing zone. So you have to reach behind every time you need a mouse, again, not an ergonomic position. Prop 65 warning – Varidesk has posted a Prop 65 warning on the product page of ProPlus 36 as it contains chemicals known to the state of California to cause cancer and birth defects. Heavy – ProPlus 36 weighs 65 lbs, requiring two people to take it out of the box and place it on your desktop. 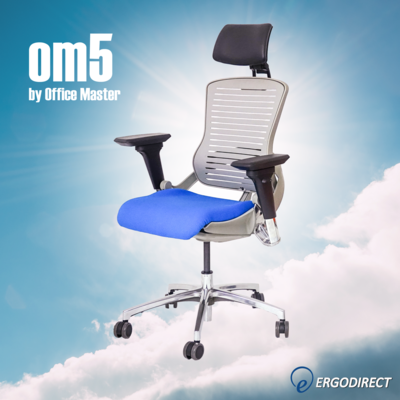 Please contact us at customerservice@ergodirect.com or 888-456-ERGO, if you have any more questions.